Stick fighting is a practical and reliable skill. But, there isn’t anything worse than a pair of beat up sticks you can’t use anymore and have to throw away. The Filipino and South East Asian Martial Arts have a great love and respect for these weapons found in Kali, Arnis, Escrima, and Silat. We adopted kali sticks where I train Wing Chun. It's now part of the curriculum. Many other schools have done the same, either formally or as a special seminar topic. 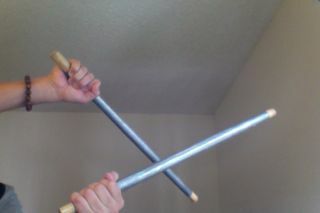 A pair of sticks work really well with Wing Chun fighters because we use two hands at the same time. In fact, our butterfly swords work as a pair too; one sword for each hand. So stick fighting is a natural fit, and probably more practical in a real life situation. How do you make your fighting sticks last longer and save some money? I’ve seen two basic types of stick fighting weapons used for training or battle: solid - wood/bamboo, or softer - rattan. Solid – After a bit of training and hard beatings these can crack, split, or splinter. If that happens, they are no longer safe to use in training and are not reliable in self-defense anyway. It’s time to get a new pair of sticks and these are typically the more expensive type of weapon available. A similar problem happens after bit of training and hard beatings. But instead of splitting, cracking, or splintering, rattan sticks fray, weaken, and get “mushy.” Think of a cardboard tube that has bent and is bruised and lost its structure; useless. The secret is to do it when they’re still new! When they’re new, their structure is intact and taping helps maintain the integrity of your sticks longer. I know some who use tape for repairs, but this never works out well. Once the integrity is lost, you’re swimming against the current. I’ve been using the same pair of rattan sticks for over two years and they’re still in great shape. I’ve gone up against other rattan sticks, harder bamboo, and heavy wood sticks too. They’re holding up because I reinforced them with duct tape when they were brand new. 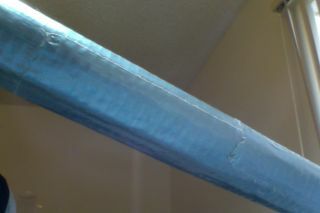 I initially put one overlapping layer of duct tape on my sticks (see image above). I found overlapping is important because the point of failure is at the seams, or the edges of the tape. They tend to be the first areas where the tape peels or lifts exposing what’s underneath. When the tape starts to get beat up, I apply another layer on top of it. I’ve done this “tuneup” at least four times with my current pair. I don’t remove the prior tapings, I just put a new layer on top of the old. This saves time and the added tape adds more structure and heft. If it gets too thick, I’ll probably remove the old tape then. Some people prefer electrical tape. I haven’t used this myself. I like duct tape because it’s thick and wide; it takes very few strips of duct tape to wrap a pair sticks. And it’s reinforced with cloth so it lasts long. Some people like to tape their sticks because it gives them better grip. I find this to be true. Some say taped sticks look ugly. I agree. What you can do in this case is own two pairs of sticks. The taped ones for training, the pretty ones for demos. If you’re really into stick fighting, make sure to switch out different size, weight, and odd length sticks, pipes, baseball bats, and more to train, to be more flexible. My sticks are about 25 inches (64 cm) long and one inch (2.54 cm) in diameter, using different weapons does keep me on my toes. Some have talked about using PVC pipe as a cheap yet solid substitute for fighting sticks. As a kid I used to play with left over PVC pipe and it does enough damage to be effective. Just pick some up from your hardware store and have it cut to size. If you like hitting things really hard to get a realistic workout, like I do, do some stick fighting against a heavy bag. I can do full force swings against the bag, including stabs and jabs, and there is no damage to my sticks, and so far, no damage to the bag either. This is also a great way to condition your hands and build up callouses in the right spots.